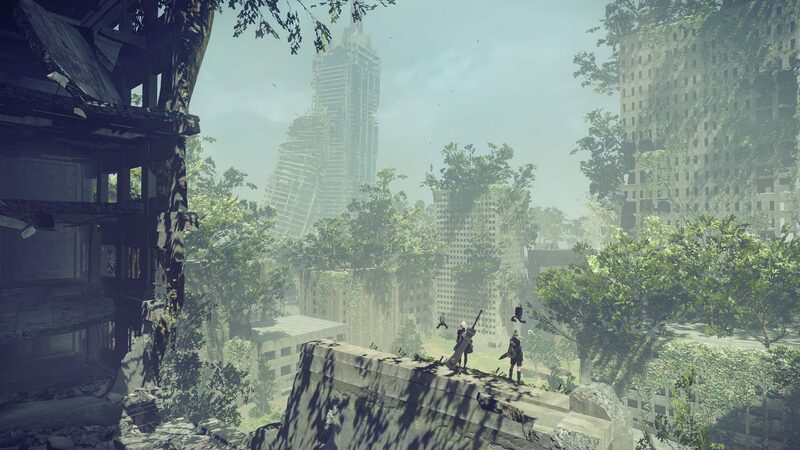 Overclock is a Support Chip in Nier: Automata. Slow time for 0.8-5.5 seconds after a Perfect Evade. Dropped by Small Flyers in the Factory: Hangar accessable during and after the Twisted Religion chapter. The most efficient way to reach the cap (5.5 seconds) on the length of Overclock is to equip one +3 [♦7] chip and one +4 [♦9] chip (total 16 cost). Character moves at normal speed during Overclock, while everything else moves slower, unlike the Evasive System chip. +4 Slow time for 3 seconds after a Perfect Evade. ♦9-? +5 Slow time for 3.5 seconds after a Perfect Evade. ♦11-? +6 Slow time for 4 seconds after a Perfect Evade. ♦14-? +7 Slow time for 4.5 seconds after a Perfect Evade. ♦17-? +8 Slow time for 5.5 seconds after a Perfect Evade. ♦21-? These can be farmed on Route C by 9S: Factory: Hangar 3 Small Flyers, ~45 seconds round-trip From the Access Point, exit the silo on the far side, and go right. Continue around the catwalk to the bridge, and the Small Flyers will attack you from above. Factory: Furnace 4-6 Small Flyers, ~3 minutes round-trip From the Access Point, exit the room on the far side and continue to the left. Ignore/kill the Multi-leg Medium Model (Weapon Attack Up chips), go down the flights of stairs, and ignore/kill the Multi-leg Medium Model, then enter the silo. Take the door to the left, go down the stairs, and climb on top of the first machine press. Turn around, jump on the press to the left, then left onto the platform. Kill the 3 Multi-leg Medium Models, climb to the top right platform, then jump to the right on top of the press. Slowly walk over all the area on top of the press, taking your time, as the Small Flyers slowly spawn. Continue to the right on each press, picking up any drops behind you. Fall off the rightmost press, then proceed left, jumping and dodging the presses. Each press hits 3 times before a delayed hit. Kill the Multi-leg Medium Model and collect any loot that fell, then continue left to the start of the room. Retrace your steps back to the Access Point. I personally like alternating these routes, as you&apos;ll farm not only Overclock chips, but Weapon Attack Up chips and Filler Metal as well. Is it confirmed that overclock-chips stack? Causing a bug if I get hit in the last second after an evade or evade at the same time as a hacked enemy explodes. Audio completely goes out and if I exit to PS4 home it causes loud buzzing. Fixes itself after a few minutes. +8 gives 5.5 seconds, +7 gives 4.5. the rest follow a simple +.5 scale. if my math is right, that means the best way to get the max time is to just use a +3 and +4.